Developed by Survios, Creed: Rise to Glory puts you in the gloves of Adonis Johnson—the protagonist from Creed, a spin-off/sequel to the Rocky movie franchise. But this is by no means a one-to-one with the film. Instead, it’s meant to capture the essence of that experience. Virtual reality is the perfect medium for this realistic boxing simulator as you comfortably (but wearily) throw punches with your PlayStation Move Controllers. While not exactly in the exercise game genre, Creed: Rise to Glory is the by far the best video game workout I’ve ever had. But its strong gameplay elements are undermined by a lack of story and monotonous training sessions. Packed with all the essentials, going from workout to workout in the gym gets you in the fighting mindset while giving you practical help for your matches. Completing a workout regimen is a necessary step in between fights, but doing extra training can boost your in-game stamina. Workouts include running on the treadmill by holding down the move button and swinging your arms, a page straight out of Survios’ Sprint Vector, and practicing throwing your punches. You can hit the heavy bag, body opponent bag, double-end bag, and eventually hit the pads in a meat locker. Eventually, you can hit a hunk of beef in the meat locker as well. Each piece of equipment has its own minigame style challenges usually based on speed or being able to switch up your points of contact. The gameplay loop is a constant back and forth between training in the gym and fighting matches. It’s a routine that quickly becomes a rut. Training is inherently repetitive in real life, but it’s worth it for the results and comes with plenty of breaks in-between. Video games don’t have that, so they need to approach it differently to avoid stagnation. While there’s some element of a progression system here, it’s not enough to make the experience fun. It’s a good workout, but it’s a bit of a slog. Your punching speed and power counts, both in minigames and in the ring. Like any boxing coach will tell you, it’s important to never put your gloves down. In fact, in Creed keeping your gloves up and still will replenish stamina. Having spent a summer learning the basics of boxing, one of the core things missing from this game was concrete technique tips. There are no directions in terms of how to actually throw punches properly nor did it mention the ones at your disposal. A video game simulation can only get so close to life, but this seems like a basic thing that would’ve given players a more realistic experience while helping them land hits more effectively. You’re never introduced to words like jab, cross, hook, or uppercut. And the lack of conversation you have with Rocky while he holds the pads for you just feels unnatural. For a coach, he doesn’t give much direction, guidance, or inspiration. Where are those iconic speeches? Those new to boxing will fair fine, but they’ll miss out on some key techniques that would help them step up their game and enjoy their time a bit more. As far as the boxing matches themselves, I appreciated how each fighter had their own attributes. I was filled with excitement, and even a bit of anxiety, each time I stepped into the ring because it was always different. The environments themselves changed with each match, but usually this wasn’t anything too noteworthy aside from, for example, the lively ring at the bar in Tijuana, Mexico. Matches do a great job at incorporating training elements, such as highlighting key places to hit your opponent when they’re on their way down. Survios successfully draws on realism while taking advantage of the video game medium to create a competitive experience for players at any level. For instance, moving your head to dodge a hit will slow down time, giving you a quick advantage. Similarly, when you do go down for the count you have an out-of-body experience. To get back up, you have to sprint back into the ring. Making you literally return to consciousness is as unique as it is brilliant. 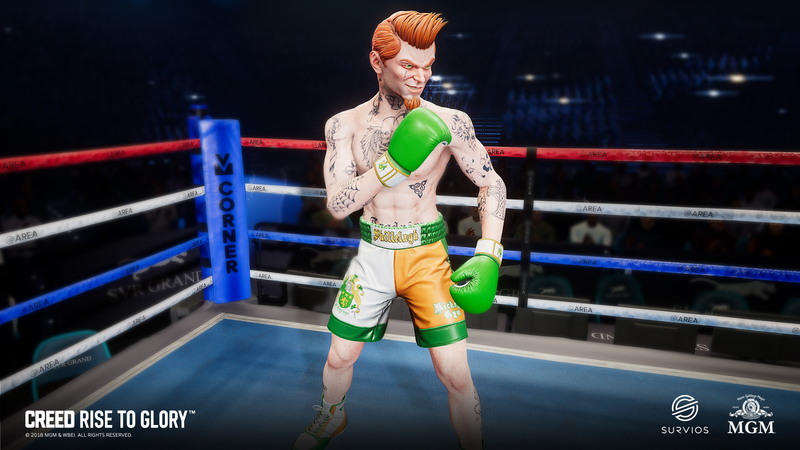 Creed: Rise to Glory feels a boxing simulator with a Creed skin placed over it rather than a game drawing inspiration from the world it’s allegedly based on. The most jarring misstep in my 2+ hour playthrough was the lack of story. The swelling music over the title screen made me feel I was in for the true Creed experience but instead the game consisted of a single narrative set piece when Adonis’ girlfriend angrily calls and you get to play out what happened the night before. More moments like that would’ve offered some much needed padding to make this feel like a full fledged game rather than an elongated demo. Depending on your play-style and fitness level, Creed: Rise to Glory will take you anywhere from 90 minutes to 4 hours to finish. After the campaign, you can face opponents online or go back to individual fights. Brevity is something that characterizes a lot of VR titles but, while it’s often seen as a negative, I’m a firm believer that time doesn’t have any bearing on a game’s quality. In the case of Creed, I would’ve been okay with the short experience had it been more rounded. The end of your big fight is met with nothing but a credits screen: no ending cutscene, no inspirational speeches, nothing. It’s an anti-climatic moment that encompasses the entire game perfectly. Creed: Rise to Glory is superb as a boxing simulator, but it’s almost non-existent in its storytelling. The spirit of Creed and the Rocky franchise isn’t just in the fights, it’s in why they fight, and that’s something this game completely fails to capture. As someone that loves boxing as a workout, this is an interesting title to have in my collection, but if you’re looking to feel like Adonis Creed, you’ll be a bit disappointed. This VR game lands some good punches, but it is far from achieving a knockout. Creed: Rise to Glory review code provided by publisher. Version 1.02 reviewed on a Standard PS4. For more information on scoring please see our Review Policy here.